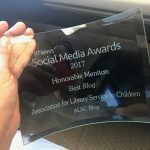 Thank goodness for the ALSC Institute! As a long and busy summer speeds right into an even busier fall, I was starting to feel just the tiniest bit stressed. Conferences like this one provide an intense oasis, rich with ideas and possibilities, where I can get away from my day-to-day job (deadlines! emails! reports!) and focus on The Work. Every single one of the sessions I attended at the Institute offered not only valuable nuggets of inspiration and information, but also fertile ground for bursts of creativity. How would the admirable programs and services I was hearing about would translate to my own system? My brain has been fizzing with exciting possibilities. The Columbus Public Metropolitan Library’s Ready to Read Corps; Hedberg Public Library’s well-rounded early literacy staff development plan; Arapahoe Library District’s emphasis on storytime competencies; Cuyahoga County Public Library’s focus on offering a continuum of service from birth through age 18 based on careful planning and best practices. The amazing librarians in these systems saw what their communities needed, figured out how to meet that need, and then made things happen – even if it meant years of planning and raising money. Talk about inspirational! 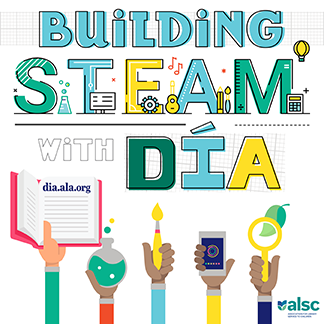 The ALSC Institute not only supplied practical tips and great ideas aplenty, but it also created an opportunity for attendees to ponder and plan. For a few days, we let our imaginations go wild, playing with all the ways we can make our libraries better than ever. We arrived back at work buoyed by a new appreciation for our profession and the truly transformative power it can have in our communities. In other words — we’re fired up and ready to go! Common Core in the Public Library? Wow, thanks for the mention! We had such a good time sharing & learning from everyone at the ALSC Institute…I too have copious notes from the Columbus and Cuyahoga sessions, as well as the Hedburg Public Library’s account of their indepth Every Child Ready to Read staff training. So much to think about! Well put, Eva! It was inspiring to hear the authors and the other librarians share their passions and talents. I went home recharged and ready to try a few new things–like reading Peter Brown’s Children Make Terrible Pets with first graders this morning–a huge hit! It was an amazing conference, and I was honored to participate. I have posted my presentation and handouts on the ALA Connect website under the 2012 ALSC National Institute community. Look for them there, if you are interested. Thank you for taking the time to view my presentation. Thanks for those online great handouts, Sarah! And whoops, I misstated the name of your library system – should be Columbus Metropolitan Library, of course. I’ll correct the post.